1964 (Courtesy Michael Ford, Delphos Herald) Tales of adventure at sea often capture children’s attention. Sometimes, those stories may even influence the course one navigates in adulthood. Though he never met a mermaid, one area man hoped he would when he left home to sail the seven seas at age 17. Gomer resident Paul Ford, Jr., 62, grew up hearing familial accounts of visits to exotic ports. He said these stories inspired him to sail the globe and serve his country in the United States Navy. “I enlisted because there was some Navy tradition on my mother’s side of the family. I had an uncle who retired as a warrant officer 3 and I had a cousin who retired as a lieutenant commander. I had heard of all the places they had been to and I wanted to travel the world,” he said. Ford acquired parental permission to join the Navy and completed 16 weeks of basic training at the Great Lakes Naval Training Station near Chicago in the winter of 1964-1965. 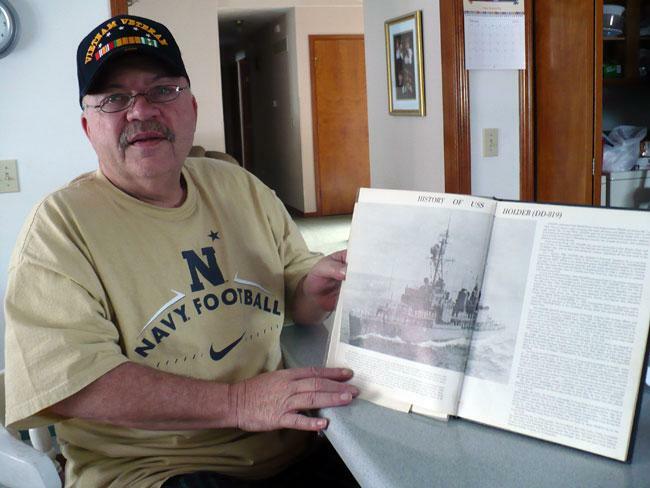 In March, he was sent to his first duty station: the Naval Submarine Base in New London, Conn. The machinist mate spent a few months on a tug boat that moved submarines around the harbor and transported sailors between ship and shore. He also worked in a repair shop that maintained the same vessels and stood honor guard for a few newly-commissioned ones. He also stood duty as a firefighter at the base fire station. After a year, Ford was assigned to a destroyer, the USS Holder, which was “homeported” in Norfolk, Va. He climbed its plank for the first time in March 1966 but didn’t know he was headed for war. “I went to the Holder because I wanted sea-duty. The Vietnam War was going on but I didn’t really know about it when I got to the ship. We left Norfolk on June 1 and headed for the Panama Canal. We stopped for fuel in Panama and Guam before we spent two weeks at Pearl Harbor while they mounted two 50-calibur machine guns on each side of the bridge,” he said. The ships heavy artillery consisted of two barrels forward and two aft that fired 38-inch shells that were 5-inches in diameter. Ford explains that the Holder delivered gunfire support for ground troops in the jungle. “We crossed the International Dateline on July 1, went to Guam and Hawaii, then we arrived at Vietnam in the Tonkin Gulf. Our first job was what we called ‘plane guard’ for the USS Ranger, which was engaged in air strikes. On July 28, we were assigned to provide Naval gunfire support off the coast as part of Operation Hastings. We were also in Operation Independence and Operation Golden Fleece. We anchored off the coast anywhere from 500 to 1,000 yards, depending on how close we could get. Our guns were accurate at 7 miles and had a maximum range of 9 miles. We hit 80 percent of our targets. One time, ground troops had the enemy inside a cave and we were ordered to hit it on the side but we put the shell right through the mouth of the cave from 4-6 miles away; that’s how accurate we were,” he said. There were also other forms of gunfire support. “We fired 2,989 of those shells but we also fired napalm and what they called ‘flare shots.’ If we were along the coast and there was a fire-fight going on, we would fire a flare shot that would explode in the air and drop to light up the ground,” he said. Aboard ship, Ford’s life was spent in the “belly of the beast.” “A machinist mate runs the engine room and I worked in the main control engine room. It was very hot down there; we had temperatures as high as 120 degrees. Generally, at sea and especially in a war zone, you work 16-hour days. So, when it got hot like that, we’d go 2 hours on and 2 hours off. We had to constantly drink water and the only ventilation we had was from air ducts that blew in outside air that was not as hot as we had inside the engine room. When your clothes got sweaty, you could stand in front of the air duct and feel a little cooler,” he said. “I also had general quarters; my battle station was to monitor the phone that was attached to the bridge damage control radio. I was the first one in the engine room to know what was happening and they also used that phone to call down and tell us what speed they wanted the ship at.” The Holder anchored in a given location until the smoke cleared on the ground. Then, the ship would offer support at another coastal spot. On one occasion, it was literally sent “up the river.” “We had to take some Recon Marines up into the Saigon River and drop them off. We took a couple of Vietnamese officers to guide us; going in there was about the scariest thing we did. I was down in the engine room but I never heard of anything happening that day. However, we were fired upon from time-to-time. We were concerned about being hit with mortars, rockets, anti-tank weaponry or machine gun fire. People up on deck or on the bridge were exposed to that but mere bullets couldn’t penetrate the hull,” he said. Whenever the Holder pulled up anchor, Ford got to see the kinds of places he would tell his boys about many times. “We were in Vietnam from July to September. We had been back to the Philippines five times for upkeep and supplies; to Sasebo, Japan for repairs; and Hong Kong for two weeks of R&R. We went back later for 10 days of things like shore patrol and proceeded from there to the Suez Canal. People on the Egyptian side of the canal were waving and happy. People on the Palestinian side were giving us ‘the finger’ and shouting obscenities at us. Some of the guys up on deck started yelling obscenities back until the captain make everybody go down below deck and close the hatches,” he said. Once we got through the Suez, our first liberty port was at Cochin, India. We stopped there, then made our way through the Indian Ocean, the Red Sea and up into the Mediterranean. We saw Athens, hit the Atlantic and headed home to Norfolk.” The ship underwent repairs in the Naval yard at Portsmouth, Va., for six months. Then, the Gomer ‘pirate’ went on a Caribbean cruise to test-run the Holder’s repairs before a NATO goodwill cruise in the British Isles. Ford visited his ancestral home of Derry/Londonderry, a city split claimed by many in both Ireland and Northern Ireland. He also went to Gloscow, Scotland, where he boarded a plane for New York City. 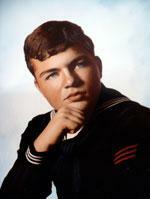 He was discharged from the Brooklyn Naval Yard on Feb. 28, 1968. However, he wasn’t finished with the military. “Because I was 17 years old when I enlisted, they had to discharge me before I turned 21. I had been in active duty for 3 years, 3 months and 19 days but I had a 6-year commitment. I fulfilled that in Lima and when I got out of the Navy Reserve, I enlisted in the Ohio National Guard,” he said Ford gave approximately 14 years serving the home of Old Glory. He was awarded several commendations; many of which the government has yet to give him. In addition to the Combat Action Ribbon he earned by the Holder being fired upon, he has two National Defense ribbons — one from the Navy and one from the United States Army. He also earned the Armed Forces expeditionary, Vietnam Service and Navy Unit Commendation ribbons, as well as a NATO shield. Like the great majority of our nation’s veterans, Ford remains extremely proud of his years in the Navy. “I’m very proud and excited about the time I spent in the Navy. I’m a very fortunate man to have had the opportunity to serve my country and see the world,” he said. Paul Ford Jr with his ship.